Shamian Island viewed from Guangzhou mainland. Western-style buildings on Shamian Island. 1920s map of "Shameen", showing the location of the British and French concessions. The West Bridge, also called the "Bridge of England", in 1939. Our Lady of Lourdes Chapel on Shamian Island. Former German Consulate and Asiatic Petroleum Company building. Shamian Island (also Romanised as Shameen Island or Shamin Island (both from its Cantonese Chinese pronunciation)), is a sandbank island in the Liwan District of Guangzhou city, Guangdong province, China. The island's name literally means "sandy surface" in Chinese. The territory was divided into two concessions given to France and the United Kingdom by the Qing government in the 19th century. The island is a gazetted historical area that serves as a tranquil reminder of the colonial European period, with quiet pedestrian avenues flanked by trees and lined by historical buildings in various states of upkeep. The island is the location of several hotels, a youth hostel, restaurants and tourist shops selling curios and souvenirs. The island covers an area of 0.3 km², 900 m from east to west, and 300 m from north to south. It is bordered in the south by the Pearl River, and it is separated from the mainland by a canal. Shamian Island was an important port for Guangzhou's foreign trade from the Song to the Qing Dynasty. From the 18th to the mid 19th century, the foreigners lived and did business in a row of houses known as the Thirteen Factories, on the banks of the Pearl River to the east the present Shamian, which was then an anchorage for thousands of boat people. Shamian became a strategic point for city defense during the period of the First and Second Opium Wars. In 1859, the territory was divided in two concessions given to France and the United Kingdom (of which 3/5 belonged to the British and 2/5 to the French). It was connected to the mainland by two bridges, which were closed at 10pm as a security measure. The British arch bridge, also called the "Bridge of England" and built in 1861, to the north was guarded by Sikh police officers, and the French bridge to the east was guarded by Vietnamese (Cochinchina)) recruits with the Troupes coloniales. After 1949, the mansions of Shamian became government offices or apartment houses and the churches were turned into factories. 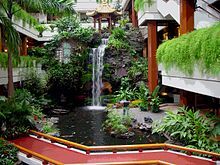 Waterfall inside the White Swan Hotel. A public garden on Shamian Island. The French Catholic chapel, Our Lady of Lourdes Chapel (露德圣母堂), has been restored and stands on the main boulevard. Located at the French end of the island, it was completed in 1892. 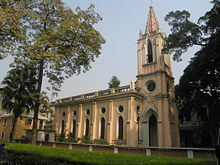 The British Protestant church, Christ Church Shameen (沙面堂; Shāmiàn Táng) was built in 1865. The community includes the Shamian Police Station (沙面派出所; Shāmiàn Pàichūsuǒ). While Shamian Island has historically been the site of a number of consulates, the only one located on Shamian Island as of 2014 is the Consulate of Poland, at No. 63 Shamian Main Street. Czechoslovakia. The Czech Consulate was for some time located at No. 1 North Shamian Street, in a 1911 building, which later hosted the North Korean trade delegation in Guangzhou. France. No. 20 South Shamian Street. Germany. No. 59 Shamian Main Street South. The building also housed the Asiatic Petroleum Company. Japan. No. 22 South Shamian Street. Norway. No. 54 Shamian Main Street North. United Kingdom. No. 44-46 South Shamian Street. Soviet Union. The Soviet Consulate was for some time located at 68 Shamian Main Street North, in a 1916 building. Portugal. No. 42 South Shamian Street. United States. The U.S. Consulate Guangzhou was located at No. 56 Shamian Main Street North from 1873 to 1938, and later during several months in 1949. 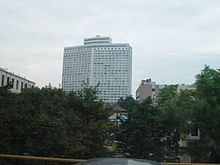 In April 1990, the consulate moved again to Shamian Island, where it occupied the Consulate Tower, a new building at 1 Shamian South Street, built on reclaimed land near the Pearl River and next to the White Swan Hotel. In 2005, the Consular Section of the Consulate moved to a location in Tianhe District. In July 2013, the Consulate was relocated to a new building within Zhujiang New Town. Schools in the community include Shamian Primary School (沙面学校; 沙面學校; Shāmiàn Xuéxiào) and Shamian Experimental Primary School (沙面实验学校; 沙面實驗學校; Shāmiàn Shíyàn Xuéxiào). 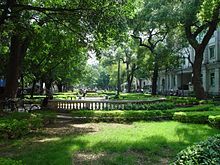 Shamian Park (沙面公园; 沙面公園; Shāmiàn Gōngyuán; saa1 min6 gung1 jyun4) and the Shamian Tennis Courts 沙面网球场; 沙面網球場; Shāmiàn Wǎngqiúchǎng; saa1 min6 mong5 kau4 coeng4) are in the community. Various bronze statues are scattered around the island which depict life as it was during earlier periods on the island, as well as from more recent times. For example, one statue entitled "A gentleman, a lady and a darn woman" shows a Western couple watching a Chinese woman darning cloth. 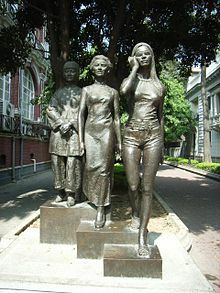 Another depicts the changing appearances and stature of Chinese women, with a woman from colonial times in traditional clothing, a slightly taller woman from the early or mid 20th century wearing a cheongsam, and a relatively tall and slender young Chinese woman wearing shorts and talking on a mobile phone. 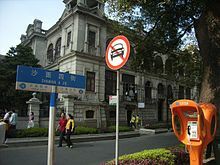 The three east-west streets of the island, formerly named "Canal Street", "Central Avenue" (a tree-lined boulevard), and "Front Avenue" (originally lined on the riverside by parks) were renamed "Shamian North Road" (Shamian Beijie), "Shamian Main Street" (Shamian Dajie), and "Shamian South Road" (Shamian Nanjie). The five north-south streets are named Shamian 1 Street to Shamian 5 Street. Huangsha Station of Guangzhou Metro is located within a short walk from the island, via an overpass crossing the busy Liu'ersan Road. There is also a ferry running from Huangsha Pier to Fangcun Pier, which runs every 10 minutes carrying foot-passengers and bicycles. Fares are from 0.5 RMB for a foot passenger and 1 RMB for a passenger with a bike. There are no public buses on the island itself, although there are several nearby bus stops. ^ a b c "Guangzhou government page about Shamian Island". Guangzhou.gov.cn. 2010-06-23. Retrieved 2010-11-17. ^ a b "''China Daily'' article on Shamian island". Chinadaily.com.cn. 2004-01-17. Retrieved 2010-11-17. ^ a b c d "''Fodor's''". Fodors.com. 2010-11-01. Retrieved 2010-11-17. ^ a b "Eight things you might not know about Guangzhou". throughtrain.com.hk. Retrieved 2014-12-29. ^ "Book review of ''Everything in Style: Harriet Low's Macau''". Asianreviewofbooks.com. Retrieved 2010-11-17. ^ An Official Guide to Eastern Asia, Trans Continental Connections Between Europe and Asia. Vol IV China. Tokyo: Imperial Japanese Government Railways. 1915. p. 344. Retrieved 19 July 2011. ^ Jonathan Fenby (2004). Chiang Kai Shek: China's Generalissimo and the Nation He Lost. ISBN 0-7867-1484-0. ^ Alfred H. Holt (1925-08-10). "Shameen Shooting". TIME. ^ "Shamian Photos, Captioned Pictures Photo 20". Greatmirror.com. Retrieved 2010-11-17. ^ "Christ Church of Shamian Main Street". Zhongwenweb.com. Retrieved 2010-11-17. ^ "History of Consulate Guangzhou". Consulate General of the United States Guangzhou. ^ "Shamian Photos, Captioned Pictures Photo 11". Greatmirror.com. Retrieved 2010-11-17. Wikimedia Commons has media related to Shamian Island. Map of Shamian island. Updated in 2004. Pictures of Shamian Island, with detailed captions. Includes colorful historical descriptions of the island and its residents. An American in China: 1936-39 A Memoir. The website is a companion project of the book collecting the 1930s writings of Thomas, Gould H. (June 2005). An American in China 1936-1939: A Memoir. Greatrix Press. ISBN 978-0975880005. This page was last modified on 31 March 2015, at 14:01.